Devices connected to Internet are now part of our everyday life, as well as in small animal clinics. Provet Weight Check Point, developed by Finnish Net Solutions, has been eagerly adapted by clinics. Internet of Things (IoT) means the expansion of the Internet network into devices and machines. Provet Weight Check Point is doing just that. Automating a simple, constantly repeating routine is of interest to everyone. If the clinic has 10,000 animals to be weighed each year and each animal’s weighing, saving the weight, and microchip reading takes 1 minute, then automating this step saves 10,000 minutes per year, i.e. 20 working days a year. Managing the job automatically saves both staff time and considerable money. Provet Weight Check Point is a combination of scales and microchip reader. When a customer comes to the clinic, he puts the animal on the scale and reads the microchip. 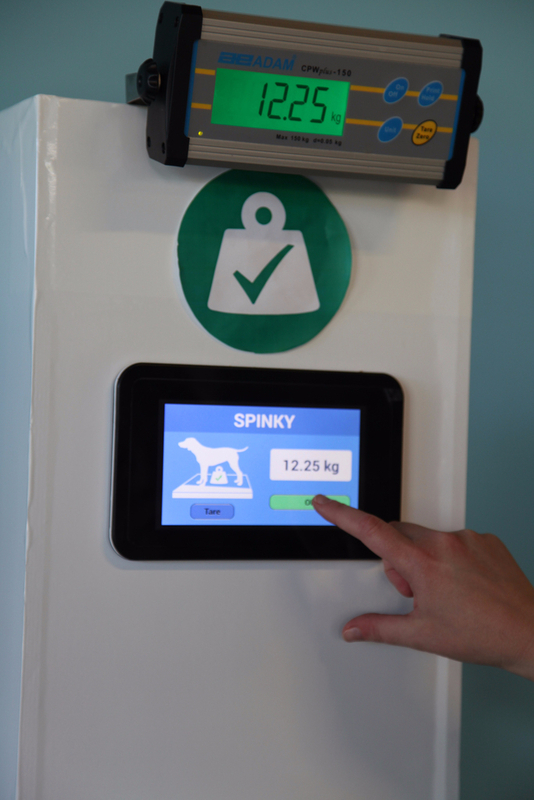 By pressing the button, Weight Check Point automatically saves the weight to Provet, the clinic’s browser-based ERP system. At the same time, the chip is automatically checked. In Sweden, for example, insurance companies are keen to ensure that the animal’s chip is checked every time it visits the clinic. Logging the weight manually always includes a risk of error. In addition to saving time, the number of faulty entries in the clinic decreases. ”Provet Weight Check Point has received an enthusiastic reception, and it is becoming increasingly common in Finnish small animal clinics. The positive experiences of the test users about saving time and money have convinced others, and now there is interest in other European countries, as well. Weight Check Point will hence be taken for trial use in other countries”, says FNS CEO Janne Huttunen. FNS is a Finnish human-centric software company that provides its services using agile software development methods. It has hundreds of customers in Finland and abroad. FNS employs more than 50 software professionals.